I see this confusion quite a bit on the forums, and will address why Ayahuasca is completely different from smoked dmt. It all started when Western Explorers in the Amazon equated Ayahuasca completely to "orally activate dmt" and ignored the Elephant in the room, which is Caapi. To sum it all up in one sentence, DMT does not block serotonin, whereas tetrahydroharmine does, THH is the 2nd largest alkaloid in caapi, not found in rue. Serotonin blocking is a main effect of all the natural oral entheogens like LSD, mushrooms, mescaline, 5-meo-dmt, bufotenine (found in snuffs). DMT is super potent at all the other 5-ht receptor sites, way exceeding even psilocin (see chart below), but in doing so, it must give up 5-ht1a binding, (serotonin blocking) which makes up over 80% of brain 5-ht, so when you combine dmt with thh and other components of caapi, you get the required "team action" which makes it complete. There is a world of difference between Ayahuasca and smoked dmt. Ayahuasca is named after Caapi, and doesn't even need dmt to call itself Ayahuasca, Plant admixture psychotria DMT mainly acts to light up and color the visions from the Caapi vine according to Ayahuasca Shamans. Experienced Ayahuasqueros can see the visions even in low light or with very little if any admixture plant. DMT can also be made complete with tiny amounts of 5-meo-dmt as it fills in for the missing 5-ht1a serotonin blocking action that is missing with DMT. New discovery: the recently discovered adrenoglomerulotropine (a hormone of the pineal gland, otherwise known as 6-Methoxytetrahydroharman) is an isomer of tetrahydroharmine, found in caapi. Caapi was said by the Indians to have Telepathine qualities as Ayahuasca was said to facilitate telepathic communication among tribal members. Also contrary to what Wikipedia states, mescaline does not work thru the 5-ht2a receptor, but mainly thru the adrenal sites and it's strong serotonin blocking action. LSD has very strong potency in blocking the action of serotonin. The morpholide lysergamide cousin had only about 1/10th the potency in blocking serotonin. Of the 5 diferent dialkylamides we studied LSD was the most potent and specific serotonin antagonist. As we go thru day to day life, the brain serotonin filters (or gates) are in place so that we will not be overwhelmed by the perception of the way things would appear to an un-filtered mind, or "Mind at Large" as Aldous Huxley describes it in "Doors of Perception" as "infinite or eternal". He also referred to the visions as coming from "the other world" in his book "Moksha". I prefer to think of it in similar terms as well "the spirit world" or "the other world". 5-ht1a inhibition theoretically causes this filter system to be lifted, and the infinite mind to manifest in combination with dmt for example. An example of the importance of adding the serotonin reuptake inhibition properties of 5-meo-dmt for example to dmt (which totally lacks 5-ht1 reuptake properites on it's own) is shown below. This is the same way the snuff's are used in the amazon, as they naturally combine dmt with additives which cause the reuptake of 5-ht like bufotenin for example. ** With the addition of the 5-MeO-DMT containing toad-venom to the DMT however, the visual characteristic was completely different and totally unique to my experiences so far. On this occasion there was a complete lack of ‘dots’ or ‘points’ of any kind, the fine lines of the constantly changing imagery were like those painted with a single-hair brush on Tibetan thangkas and due to the overwhelming artistry of what I was seeing, I could only think of the vaulted ceiling of the Sistine Chapel in comparison. Tetrahydroharmine (THH) has the ability to raise your vibration in a most powerful, yet subtle way. It brings a crystalline prismy texture to spice and adds a super clear watery dimension to Aya, like looking down through 10meters of shimmering Caribbean Sea on clear blue day. It brings a dimension of pure light to the entheogenic experience and encourages entities & intelligences of only the Highest Order. If one is not accustomed to perceiving these experiences with a spiritual perspective most of the nuances & subtleties THH brings on are overlooked and remain unseen and one would better enjoy Harmaline as a house painter chooses a roller over a brush, its about preference & choice. Ayahuasca is Banisteriopsis caapi. It contains mostly harmine, thh & harmaline. B. caapi itself contains no DMT and can be used as is to produce visionary states that are like mental day dreams which lack true visual content. Often admixtures are used to increase the visual content of the ayahuasca dreams. Most admixture plants contain DMT. Harmine & thh & harmaline used alone, can produce a mild dreamy psychedelic experience in which daydreams or lucid dreams can be experienced if the user chooses to do so. These dreams from the harmalas alone are vague and lack visual content, but usually have story lines and can be quite complex just like a real dream. The harmalas allow one to go in and out of dream consciousness at will. It takes some practice to learn how to enter a lucid dream with the harmalas alone. The harmalas won’t make you enter a lucid dream. You have to do it yourself by allowing your mind to drift off into a lucid dream. DMT used alone, produces an intense visual experience, often very chaotic and fast moving, and quite amazing to watch. The visions of DMT alone usually lack meaningful content. The DMT visions are often just constantly morphine colors and shapes. Most of it makes absolutely no sense. Rarely will the visuals present to you a full blown dream with people, places, a story line, etc. But this does sometimes happen. But usually you just get a bunch of bazaar visions that are difficult to understand. Using harmalas in very low doses, just as an MAOI, is not the same as using properly made ayahuasca. If the harmalas are used in low doses just for it’s MAOI effects, the trip lacks dream content and is just a bunch of bazaar DMT visual effects. This is not ayahuasca-like, it’s just orally activated DMT. That’s not the same. Its true that some ayahuasca is prepared this way, but such Ayahuasca is considered inferior by most natives. With Ayahuasca, the DMT is just an additive, not the main course. This is why Ayahausca made with only caapi is still called ayahuasca and considered nearly as powerful as Ayahuasca made with additive plants containing DMT. This is something a lot of people don’t get. Ayahuasca is not simple orally activated DMT. It is the dream consciousness effects of the harmalas that are at play in ayahuasca. In order to experience lucid dreams from harmine without DMT, you need to practice a lot. But once you know how to do it, you don’t need DMT added to it anymore, unless you want the extra visual depth that DMT adds to the dreams. So, “Dmt Or Ayahuasca?”, well that question is a personal question. Some people prefer DMT-less ayahuasca. Some people prefer just orally activated DMT. Some people prefer ayahuasca with a side order of DMT. Some people prefer the truly bazaar effects of smoked DMT alone. Edited by tregar, 11 December 2018 - 11:59 AM. Edited by tregar, 11 December 2018 - 11:10 AM. Thanks for sharing, very interesting. So let me get this straight, The psychoactive effects of Tryptamines and phenethylamines are not caused by activation of serotonin receptors, instead the psychoactivity is a side affect from the blockage? Yes, absolutely right Somniferos, good to see you again as well ! I don't pretend to know anything, in fact, the more I learn, the less I know. I am a scientist however, so I dig deep into studies. I'm just reciting a new receptorome study from 2011 that sheds light on what is happening in the brain...this in turn, results in how consiousness is tuned to a new frequency, perhaps then it is tuned to "the other world", "the spirit world", or what is known as the "Akashic record" or "Universal Consiousness" in which all past, present, and future is known, all events that have happened, are happening, and will happen, all knowledge is stored. But it's more than that even, it's emotional and involves feelings, an all encompassing teacher. But it's more than that even, it's emotional and involves feelings, an all encompassing teacher who also allows your own fantasy to come into play. It's just mind-boggling how it all works together. The experience is tailor made to your own personality, just as Benny Shanon states in his book, often with an uncanny accuracy. The explorer will have exploration visions, the artist will have artistic and cartoon visions, the garden lover will have landscape and plant & flower visions, etc. p.s Sachahambi mentioned above started posting way back in 2002, not here though. I believe she is the author of several academic style Ayahuasca books in South America. I cannot afford most of her books as they are close to a hundred dollars. But I have read portions of them on google books preview. I posted this Receptorome study from 2011, as it seems it is ignored by all the academic, or they just don't plain know about it, it is technical yes, but Dr. Nichols (his papers are at heffter.org) took the time to explain what is going on in the brain, and I casually made the connection of what is happening or not happening with dmt in the brain when accidentally studying the recptorome for dmt, it's all in the study, I just put it into a chart so it could be studied side by side with the other natural entheogens. Just thought would share so it does not get buried for all eternity, The receptorome chart is a rather new important discovery. To see why mescaline does not work at 5-ht2a, simply read the Receptorome chart in post #1 above, I transcribed it's receptorome data from the 2011 paper from Thomas S. Ray linked to above the chart. This data helps to describe why mescaline is more aesthetic compared to the more analytic LSD (which lacks a bit aesthetic wise). Mescaline is the world's only off the chart (extremely strong) a2c (adrenal a2c) agonizer (4.00). The Electronics world also makes rampant use of circuits that consist of filters to block certain frequencies, allowing only portions of frequencies to pass thru. Think about how the brain may be wired in turn with serotonin blockers...as we get older we build these barriers up rather effectively, whereas a child sees all "a new". All the Native Amazonian snuffs contain trace to tiny amounts of either bufotenine or 5-meo-dmt which are both 5-ht1a agonist (serotonin blockers), both fill in for the missing 5-ht1a agonism of dmt. Recall that 5-ht1a makes up over 80% of brain 5-ht according to LSD scientist Dr. Nichols. There is a study on the newly discovered hormone in the pineal gland: 6-Methoxytetrahydroharman, which is an isomer of thh, found in caapi. This particular paper is from Dr. Naranjo. I also find it odd that modern day researchers dismiss Naranjo's study on harmaline, claiming that his studies were flawed, whereas he carried out studies on dozens of participants, showing that harmaline resulted in hours of dream-like visions (totally un-related to night time dreams). Academic Ayahuasca dreamer from Oxford: Benny Shanon quotes Dr. Naranjo's studies on harmaline repeatedly, and I concur, large amounts of harmaline by itself do result in monochorome (one-color) visions for long lengths of time (along with the nauseating side effects): perhaps the tiny amounts of harmaline (5 to 30mg) found in many Ayahuasca brews become quite active when in combination with large amounts of thh and harmine, all 3 working in tandem, I personally believe that is the case. Many Vegetal brews do not even contain any harmaline, perhaps thh & harmine plays a role in higher doses of substituting vision wise for it, we may never know as there have been no modern day studies. 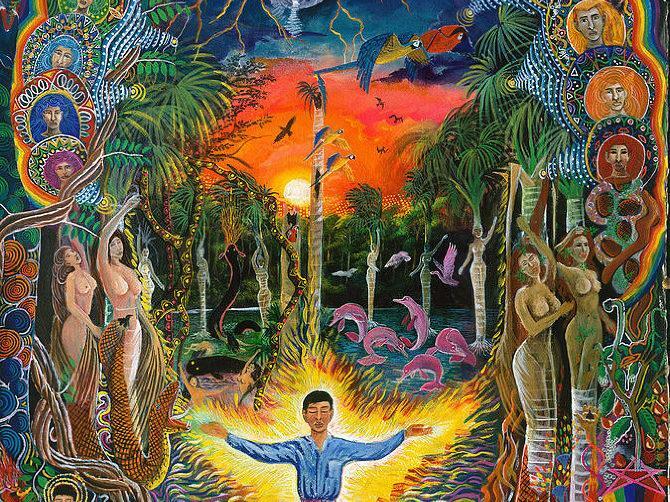 For many people, Ayahuasca-a slowed-down low-res interface of the DMT flash-seems to convey strong messages from the natural world, of nature as sentient energy and spirit matter, of the need to protect the planet we have been given. From Benny Shanon "Antipodes of the Mind"
The Ayahuasca experience is miraculous. Amerindian legends associated with the brew typically contain elements of the supernatural and the non-ordinary. The doctrine of the Santo Daime Church proclaims that the brew makes one enter another reality, the astral. The UDV characterizes the brew as cha misterioso, mysterious tea. With this, people are prone to entertain ideas and reflections of an esoteric nature. Time and again, informants have reported to me that Ayahuasca made them appreciate the existence of a hidden reality to which human beings are normally blind. With this, people claimed, hidden forces were revealed and hidden meanings recognized. With this, questions regarding the paranormal and the possibility of miracles become especially pertinent. Indeed, having undergone the Ayahuasca experience, most people--including ones with higher levels of Western education--tend to believe that all sorts of paranormal phenomena are actual. Edited by tregar, 14 December 2018 - 12:05 PM. To clarify: It is both. The psychoactive effects of all the natural oral psychedelics are a result of the activation of 20% of brain serotonin receptors (all 5-ht receptors above in the chart which are not 5-ht1a) but also the Blockage of 80% of brain serotonin receptors (see the chart in post #1 at 5-ht1a). DMT does not block serotonin by itself, but requires a component of caapi (it's second largest alkaloid) to do this....otherwise it is only activating 20% of brain 5-ht (serotonin). The gates/filters/barriers created by 5-ht1a in the brain can only be lifted or crushed to allow "mind at large" to dominate by their inactivation, which requires 5-ht1a agonism. This in turn, results in 5-ht1a inhibition or serotonin blockage. The strong anti-serotonin properties of LSD, mescaline, mushrooms, bufotenine, 5-meo-dmt can all be seen from the chart above. DMT on it's own lacks this important property without it's teamwork with caapi or 5-meo-dmt or bufotenine (both found in tiny amounts in snuffs). These snuffs from the Amazon give effects which lasts 3 hours. Serotonin blockage at 5-ht1a (80% of brain 5-ht) is needed to break down the day to day filters which are needed to survive in everyday life, they keep us for example from admiring the extreme beauty of a traffic light for example so that we will stop or go instead and mind at large will not be let loose (as Aldous Huxley describes it) to dwell in the way things would appear to an unfiltered mind, as eternal or infinite. Also, see James Oroc's vision (in post #1) of dmt + 5-meo-dmt above...before it was a vision made out of dots with dmt, but in combination with tiny amounts of 5-meo-dmt (which has strong 5-ht1a serotonin blocking activity) it became like a short transcendental Ayahuasca vision like the paintings found on the wall of the Sistine Chapel, not composed of dots, but rather fine lines of detailed paint strokes, the beauty of the artistic visions completely blew him away, and was completely unlike just dmt alone. Edited by tregar, 16 December 2018 - 09:39 AM. very informative! thanks for sharing, tregar. Although it is not mentioned anywhere above, 5-ht1a serotonin filters can be equated to helping to form one's Ego. 5-meo-dmt is the world's strongest entheogenic blocker at 5-ht1a, and totally obliterates ego into a million pieces. The other natural psychedelics like LSD, mescaline, mushrooms, Ayahuasca (containing caapi with thh) & Amazonian snuff's target 5-ht1a with extreme strength, recall that targeting 5-ht1a results in inhibition or blockage of serotonin. LSD, psilocin, mescaline and bufotenine/5-meo-dmt all found in Amazonian snuff's are all thus strongly anti-serotonin. Anti-serotonin properties result in breaking down the gates/filters/barriers so that One's consciousness can return back to the transpersonal realm from which all things--both material and mental--emerge. Words like God, infinite & eternal come to mind. James Oroc speaks alot about God in his book, he was once an atheist before he smoked 5-meo-dmt, then after that 1st time, he was converted into a believer of God, as he portrays in not only his older book "Tryptamine palace" but also his newest book. The Psychedelic Receptorome data study from 2011 is a rather new important discovery, and just thought would share so it is not lost for all eternity. Even the academic mainstream does not seem to know about. I simply transcribed the data into chart form so you can view the entheogens side by side, to gain a perspective on what is going on serotonin blocking and receptor site activation wise. 5-meo-dmt is the world's strongest entheogen at 5-ht1a (4.00), and as you can see from the chart, the energy required to apply unparalled power to the inhibition of over 80% of brain 5-ht at 5-ht1a (the built up serotonin filters in the brain which helps to make up much of "the ego") is rather large, and as a result, the amount of power left to apply as agonism to the rest of the receptors suffers as a consequence, this is why "teamwork" is seen in the Amazon: with the snuff's which combine 5-meo-dmt or bufotenine with dmt naturally...giving effects which last 3 hours, or with Ayahuasca which uses it's second largest alkaloid (thh) to powerfully blockage serotonin filters in the brain (5-ht1a) while at the same time using the admixture dmt to apply unparalled power at all the rest (the other 20%) of brain 5-ht receptors. Teamwork is the keyword here. New studies also show THH to not only blockage serotonin but apply strong additional agonism at the 3 adrenal sites associated with aesthetics and beauty. In this state of supreme resonance they actually become One, a seamless unified Whole. Such a physical event is identical to the psychological union that occurs when the lens of our ego is destroyed by 5-meo-dmt and you experience a transpersonal integration with the entirety of the universe--and remember it is not that you simply experience the entirety of the rest of the universe, you are the entirety of the universe. You have ceased to exist separately, you only exist as part of the whole--and in fact, you no longer exist individually at all. from the rest of the sea, so too my consciousness can no longer distinguish itself from the whole of the cosmic ocean. radio or your laptop receive a signal. According to the model of reality proposed by David Boh, this primary consciousness exists as an infinite holographic field that interpenetrates everything in the Universe. experience--encountering the divine realms of the Infinite, the subsequent recognition of the unity of All, and that Love is the principle that organizes the universe. subject and object, between you and the face of the divine. DMT is thus the endogenous source of the vast and rich realm of our archetypical mythology. closely related compound is very different from that of DMT. This singularly powerful compound I correlate to the seventh chakra of the kundalini system--the crown chakra--the source of that indescribable event where all boundaries dissolve, and you and God become ONE. Written language and technology are the things that separate Homo sapiens from all other species on Earth. Technology can be regarded as the concrete, outward manifestation of the inward ego: the uniquely human concentration and narrowing of focus that was required for the creation of the remarkable tools that have allowed us to become the most ominant species in history. Tools are now so focused and concentrated that we can expend billions of dollars in search of a single ghostly subatomic particle.) But our love of technology is paradoxically the most obvious source of many of the planet's most complex problems. This narrowing of focus, combined with the human fascination with our own ingenuity, has resulted in the development of nuclear, chemical, and biological weapons previously unknown to nature, while the unfettered use of out "good" technology -- agriculture, energy, medicine, and transportation--has led to an exponential increase in the human population, which our planet is increasingly struggling to support. The doubling of the planetary population over the past 50 years has contributed to global warming, because of the enormous amount of greenhouse gases that we have added to the atmosphere as a result of the Industrial Revolution, planetary deforestation, the cultivation of rice paddies, and the ever-increasing burning of fossil fuels. CO2 levels are at the highest point they have been in at least the last 800,000 years, and by 2050, CO2 levels will be twice what they were in pre-industrial days. This release of carbon into the atmosphere has also resulted, perhaps even more terrifyingly since this will affect us more urgently, in a rise in ocean acidification. The evil twin of global warming, this rise in ocean acidification was only discovered at the beginning of the 21st century. Roughly 1/3rd of the CO2 that humans have pumped into the air has been absorbed by the oceans, and by the end of the 21st century they will be 150 percent more acidic than they were at the start of the Industrial Revolution. (This increasing acidity of the oceans is believed to be responsible for the extinction of the coral reefs.) What effect this will have on the food chain is unknown, but the best-case scenario seems to be a "reduction in bio-diversity." According to Eckhart Tolle (mysticist and author), the ego will constantly try and tell you that it has reformed itself, that it has learned its lesson, and that it no longer needs to be of any concern. This has become very much how I view our relationship with technology. The modern view of technology is almost exclusively celebratory, and the pursuit of technology is viewed as somehow being neutral, no matter how patently evil the use of that technology may be, or how unfortunate the result. The behavior and influence of the unfettered ego apply as much to society as it does to the individual. The atomic bomb is clearly the most egotistical invention in history of man--entailing the belief that one person has the right to order the death of millions of other sentient beings because of a perceived political notion of right and wrong. The fact that the discovery of the effects of both LSD and the atomic bomb--came about within 2 years of each other I find quite remarkable. Both of them morally opposing inventions. Edited by tregar, 20 December 2018 - 10:24 AM. Although it is not mentioned anywhere above, serotonin filters can be equated to helping to form one's Ego. 5-meo-dmt is the world's strongest entheogenic blocker at 5-ht1a, and totally obliterates ego into a million pieces. The other natural psychedelics like LSD, mescaline, mushrooms, Ayahuasca (containing caapi with thh) & Amazonian snuff's target 5-ht1a with extreme strength, recall that targeting 5-ht1a results in inhibition or blockage of serotonin. LSD, psilocin, mescaline and bufotenine/5-meo-dmt all found in Amazonian snuff's are all thus strongly anti-serotonin. Anti-serotonin properties at 80% of brain 5-ht in combination with the psychedelic molecule acting in place of serotonin at the other 20% of brain 5-ht sites result in breaking down the gates/filters/barriers so that One's consciousness can return back to the transpersonal realm from which all things--both material and mental--emerge. Words like God, infinite & eternal come to mind. James Oroc speaks alot about God in his book, he was once an atheist before he smoked 5-meo-dmt, then after that 1st time, he was converted into a believer of God, as he portrays in not only his older book "Tryptamine palace" but also his newest book. 5-meo-dmt is the world's strongest entheogen at 5-ht1a [4.00], and as you can see from the chart, the molecular size required to dock in and apply (like a key fits a hole) unparalled power to the inhibition of over 80% of brain 5-ht at 5-ht1a [the built up serotonin filters in the brain which helps to make up much of "the ego"] is rather large, and as a result, the amount of molecular docking size left to apply as agonism to the rest of the receptors suffer as a consequence, this is why "teamwork" is seen in the Amazon: with the snuff's which combine 5-meo-dmt or bufotenine with dmt naturally...giving effects which last 3 hours, or with Ayahuasca which uses it's second largest alkaloid (thh) to powerfully blockage serotonin filters in the brain (5-ht1a) while at the same time using the admixture dmt to apply unparalled power at all the rest (the other 20%) of brain 5-ht receptors. Teamwork is the keyword here. New studies also show THH to not only blockage serotonin but apply strong additional agonism at the 3 adrenal sites associated with aesthetics and beauty. DMT opens up the mind's eye to the visionary experience--anything that can be seen or imagined can vividly exist in the DMT realm. In my lectures I correlate DMT to the sixth chakra in the kundalini system. At this level, while you can experience the existence of God in all its infinite myriad forms, there is still a separation between the subject and object, between you and the face of the divine. DMT is thus the endogenous source of the vast and rich realm of our archetypical mythology. On the other hand, the other known endogenous entheogen, 5-meo-dmt, Nick Sand described to me as "The Void", noting that the phenomenological experience of this closely related compound is very different from that of DMT. This singularly powerful compound I correlate to the seventh chakra of the kundalini system--the crown chakra--the source of that indescribable event where all boundaries dissolve, and you and God become One. The 7th shakra reveals an interconnected dimension beyond vision, thoughts, time, space--the transpersonal experience defined by Abrahaam Maslow and Stanislav Grof--which 5-meo-dmt accesses through an ego death so dramatic and instantaneous that it is impossible to find the vocabulary with which to relate the experience with the sliver of consciousness that returns, the classical mystic's dilemma. To read the effects of combining 90% dmt with 10% 5-meo-dmt (similar to Amazonian snuffs) read Oroc's "fantastic parade of the Collective Unconsciousness, the most "visionary" experience he has ever encountered" in his words, see post #1 (right below the receptorome chart) titled "DMT + tiny amounts of 5-meo-dmt"
Edited by tregar, 21 December 2018 - 08:02 PM. tregar, thanks for the information. The first two paragraphs of your post are now making things clear to me. That 5-ht1a can be compared to one’s ego and that the use of several entheogenics block the 5-ht1a and thus can shatter the ego apart. I am starting to understand the way it works with these simple comparisons. Yes, you have got it down strtman, could not have said it better myself. You theoretically subjectively retain ego-awareness without serotonin blocking...however, with serotonin blocking (5-meo-dmt, traditional Ayahuasca, traditional Amazonian snuffs, LSD, mescaline, mushrooms) your ego disintegrates. Hello divine transpersonal realm. The use of these entheogenic plants span many thousands of years of history, back to a time where it was once consumed and revered for its ability to bring someone into contact with spiritual realities, the obtaining of secret inner knowledge, and visionary experiences of a divine world. Edited by tregar, 24 December 2018 - 07:38 AM. I totally disagree with this statement, and just as professor Benny Shanon recites many of Dr. Naranjo's studies on harmaline in his book "Antipodes of the Mind", I too have found harmaline in dreams to cause hours of dream-like visions (totally unrelated to night time dreams), just as he found it did with the dozens of participants in his studies who were given 300mg + doses of harmaline orally. Along with causing visions at this dosage, there was accompanied many nauseating side effects (half of the participants vomitted). It is true that Ayahuasca contains only tiny to zero amounts of harmaline (0 to 30mg typically) as found in the brews of the UDV, Santo Daime, and Shuar (many even had no harmaline). But perhaps the tiny amounts of harmaline found in the brew become quite active in combination with the large amounts of harmine and thh in the brew (which might possibly overlap some of the harmaline receptor targets). Perhaps harmaline has a unique 4.00 max (off the chart strength) target at a particular site in the brain that is still reached strongly even in tiny amounts. Studies suggest this is possibly the imidazoline I2B receptor. And why not? every one of the entheogens have a "different" single important 4.00 max (off the chart strength) target receptor site (see receptorome chart post #1). With mescaline, it is a2c, with dmt, it is 5-ht7, with psilocin, it is 5-ht2b, etc. This would explain how tiny amounts of harmaline can still excite it's "waking dream" effects in normal Ayahuasca brew amounts. We may never know as their have been no modern day studies on this. Perhaps the harmine & thh substitute for harmaline visions in higher amounts by themselves, again no studies have been carried out. The primary action of the beta-carbolines in the Ayahuasca brew is their inhibition of peripheral MAO-A which protects the dmt in the brew from degradation and thus renders it orally active. Again, this is ignoring the elephant in the room which is caapi...and according to Gayle Highpine, who studied with Shamans in the Amazon and consumed large qty of caapi by itself, achieving "very powerful experiences indeed". This is why Ayahuasca is named after Caapi, and can consist of only Caapi by itself. Anyhow, my point is that teamwork is the keyword here. It's main effect is not just protecting the admixture from degradation, but from the combination of Caapi (let's not forget) and admixture. Edited by tregar, 24 December 2018 - 07:40 AM. whereas tryptamine, N-methyltryptamine, and N,N-dimethyltryptamine (DMT) were poor agonists. Amazonian snuff: Yopo beans have been found to contain up to 7.4% bufotenin and 0.04% 5-MeO-DMT and 0.16% DMT. At up to 7.4 % (74 mg per gram) bufotenin, an effective 40 mg dose of insufflated bufotenin requires little more than 0.5 grams of beans. 1) Why is it that boundaries seem to dissolve when serotonin is blocked & the psychedelic molecule acts in the place of serotonin? ie all the natural traditional oral entheogens & snuff's? Is consciousness being tuned to a new divine transpersonal frequency at the same time ego awareness is dissolving? 2) Aldous Huxley has written about how "Mind at Large" is let loose when the filters in the brain are lifted...is this why Children see everything "a new"? since they have not yet quite developed their sense of self and erected the boundaries that adults have? In my opinion the admixture in the brew not only helps to light up and color the visions from the caapi, but helps to visually present an archetype representation of the divine transpersonal realms in tandem with the caapi which together tune our consiousness to a new unique frequency, so that this infinite and eternal realm can be visualized and felt or experienced in ways we can understand. The ancient Greek philosopher Plato, for example, believed that all things have ideal forms (aka archetypes) of which real things are merely shadows or copies. And in the psychology of C. G. Jung, "archetype" refers to an inherited idea or mode of thought that is present in the unconscious of the individual. Benny Shanon in his book "Antipodes of the Mind" talks about how Ayahuasca reveals a Platonic philosophy, one in which Shanon was unwilling to accept in his normal practice, but kept appearing in his Ayahuasca sessions, the ideal or perfect forms revealed. Ayahuasca as a master teacher reveals divine transpersonal realms with infinite and eternal beauty and love. All spiritual things, principles, and values such as love, beauty, art, creativity, music, gratitude, significance, Oneness, honesty, generosity, discernment, patience, and perseverance are revealed for what they are--infinite and eternal. In conclusion, plant "admixture" dmt has been shown in the recent Thomas S. Ray receptorome 2011 study in post #1 to not block serotonin like all the other natural oral entheogens, 5-meo-dmt & bufotenin. If reading the study correctly, it appears to be a "team player" in combination with something that blocks serotonin. It appears from the study that it must "give up" 5-ht1a agonism (80% of brain 5-ht survival/ego filters are then blocked) so that it can be super-potent (act in place of serotonin while it is being blocked by the other native team player plant) at the other 20% of brain 5-ht sites. The molecular docking size of the molecule can only "do so much" on it's own, where the teamwork factor seems to come in to play. The academic and doctors do not seem to be aware of this new receptorome study which points to the indigenous method of traditional use of dmt as an admixture to native plants which provide the additional serotonin blocking teamwork action. Edited by tregar, 24 December 2018 - 09:09 AM. I'd submit that Huxley is correct. Children have not YET had the time to develop all the barriers. Adults have, ergo different perception than kids. He left a profound impression on me via Doors of Perception - that the barriers are thousands of layers of defense mechanisms learned by a child to protect itself from a world of probable dangers, and to simplify thought to make getting through the day possible. I'd say this is more true today than 50 and 500 years ago when the world was a significantly simpler place. No less dangerous, just simpler. Good work on this stuff, tregar. We don't see much science and investigation on the interwebs these days. generation that experienced the horrors of World War II (a typical example of ego gone out of control) and for the generation born directly after it. transpersonal effects of entheogens so very well when he tried them in his later years. Entheogens are truly windows to the sacred, and not merely curiosities that somehow trick and confuse our mechanical consciousness. The fact that the discovery of the effects of both LSD and the atomic bomb--came about within 2 years of each other I find quite remarkable. Both of them morally opposing inventions. I'd submit that Huxley is correct. Children have not YET had the time to develop all the barriers. Adults have, ergo different perception than kids. Find it very interesting that the 2011 receptorome study shows dmt to be the only natural entheogen that does not block serotonin (see post #1) All the other natural entheogens: LSD, mescaline, Ayahuasca, psilocin, snuff's, 5-meo-dmt: all block serotonin (agonize 5-h1a which is 80% of brain 5-ht) while at the same time act in the place of serotonin, which is the other 20% of brain 5-ht...it seems to back up the Shamanic traditional use of dmt as an admixture with other plants, such as with Ayahuasca/caapi which contains thh as it's second largest alkaloid (potent serotonin blocker, see wikipedia on thh) or with snuff's which contain bufotenin (potent serotonin blocker). Snuff's give effects which lasts 3 hours, or with plants which contain trace or tiny amounts of 5-meo-dmt (extremely potent serotonin blocker). Why is it that all the natural oral entheogens (and 5-meo-dmt) insist on targetting over 80% of brain 5-ht (the serotonin filters/gates/barriers/doors are broken down when 5-th1a is agonized) that make up the filters that allow us to survive in everyday life and possibly theoretically & subjectively help to form the ego? Why is the dissolving of ego-awareness a main feature of these entheogens? James Oroc speculates that the dissolving of ego allows for the tuning of one's consciouness with the divine transpersonal realm, like a drop of water that is no longer seperate but returns to the whole of the cosmic ocean of consciousness. The realm of consciousness is much vaster than thought can grasp. When you no longer believe everything you think, you step out of thought and see clearly that the thinker is not who you are. You are the one who is aware that you are thinking. Become conscious of being conscious. Most people are not aware that they have a little man or woman in their heads that keeps talking and talking and whom they are completely identified with. In my case, and in many people's cases, the voice in the head is a predominantly unhappy one, so there's an enormous amount of negativity that is continuously generated by this unconscious internal dialogue. The voice in the head is seperate from awareness. How is it spiritual? I see it as stepping out of identification with a stream of thinking. You suddenly find there's another dimension deeper than thought inside you. When you notice that voice, you realize that who you are is not the voice-the thinker-but the one who is aware of it. The first step to enlightenment is to be an “observer” of the mind: The beginning of freedom is the realization that you are not “the thinker.” The moment you start watching the thinker, a higher level of consciousness becomes activated. You then begin to realize that there is a vast realm of intelligence beyond thought, that thought is only a tiny aspect of that intelligence. You also realize that all the things that truly matter – beauty, love, creativity, joy, inner peace – arise from beyond the mind. You begin to awaken. Edited by tregar, 27 December 2018 - 07:56 PM. ...but they also act in place of serotonin (at the other 20% of brain 5-ht receptors). Stuff like buspar and antidepressants are only "blocking serotonin" but not also "acting in the place of serotonin" like all the natural psychedelics. This is why psychedelic molecules are shaped like serotonin or other natural transmitters like dopamine (mescaline) yet still work thru the serotonin pathways. dmt is the only natural entheogen that does not block serotonin, thus it may not theoretically subjectively be able to break down filters/barriers/doors in the brain (ego and survival filters) that have been built up to defensively protect a person in this world. It requires team action with caapi, 5-meo-dmt, or bufotenin (last 2 found in Amazonian snuff's along with dmt). All three: thh, 5-meo and bufotenin block serotonin strongly. "Mind at Large" as postulated by Aldous Huxley is let loose when these filters are lifted AND the psychedelic molecule acts in the place of serotonin. Why can a single Ayahuasca or entheogenic session be more powerful in helping a person overcome their issues and be more healing than man-made antidepressants and buspar, etc. is because once again: team action: natural oral entheogens and 5-meo-dmt not only block serotonin but act in it's place, far more powerful than just one man-made molecule that "only" blocks serotonin, and thus why these antidepressants typically have less than a 50% success rate, which is not all that great. More on 5-ht1a can be read if you google the paper by Dr. Nichols (LSD scientist) "Serotonin signaling at hallucinogenic action". His papers are at heffter.org. This also helps to explain why many had found 5-meo-dmt to be very therapeutic & help kick addictions (see books on 5-meo-dmt at Amazon) Similiar to healing powers of Ayahuasca & all the other natural oral entheogens. Oral dmt admixture plants with rue components are also breaking down the ego and filters, just that there is less serotonin blocking than what is seen with caapi. There is still a level of 5-ht1a blockage seen with rue, just not to the level that is seen with caapi, but it is still there. The level seen with rue is most likely similar to the serotonin blocking capacity of mushrooms...and we can all agree that rue with admixture or mushrooms are highly capable of not only dissolving barriers, but are highly spiritual. It would be nice to have some affinity level blocking data for harmine and harmaline from rue, but it does not exist in a study that would allow us to compare it to the chart in post #1, unfortunately the scientist found it more important to do studies on many man-made psychedelics rather than focus on the components of natural ones, which I find a bit disappointing. Again this is a comparison chart for "smoked dmt" and not oral dmt admixture plants...as the title of the topic is labeled. Thanks for comments. Just bringing up the 2011 receptorome study from Thomas S. Ray, as it seems to be ignored by all academic or scientist, as thought it does not even exist, I simply transcribed the data from the study into chart form and brought up paper from Dr. Nichols so the table can be understood. The main point of this topic is that a level of lucid "ego awareness" is subjectively and theoretically shown to be maintained on smoked dmt according to the table, in other words, the filters and barriers and doors that make up the thinking consciousness & ego are left intact. Many of these defensive filters & mechanisms are built up as we move from child to adult to allow us to survive in this world...this is why children often see everything "a new" as they have not had the time yet to build up these barriers. ...While the table indicates that the opposite occurs (see 5-ht1a entry) with all the natural oral enthogens and snuffs which include: LSD, mescaline, mushrooms, Ayahuasca, oral dmt admixture plants (rue + admixture), snuffs which all contain bufotenin or 5-meo-dmt (both potent 5-ht1a agonist). DMT seems to have been made to be very potent at all the other 20% of brain 5-ht (just look at the table, it far exceeds psilocin) but in doing so it must give up 5-ht1a agonism, as the docking size of the molecule can only "do so much" which seems to back up the indigenous use of dmt as an admixture plant to use with something that blocks serotonin [to fill in for this "missing 5-ht1a agonims of dmt"]. These master plants not only block serotonin but provide awake dream effects, scenery, imagery & story-lines (ie caapi, rue, snuff components, etc.) which are completely un-related to night time dreams. Teamwork is the key word here. Edited by tregar, 30 December 2018 - 11:55 AM. OK, is there anything Qualitatively different between Rue and Caapi? You mention that Rue inhibits but less than Caapi. Might one expect different visions with one than the other? Hi pharmer.The only difference is that caapi contains thh as it's second largest alkaloid, which wikipedia identifies as a potent serotonin blocker. these natural components of caapi & rue to compare with natural psychedelics instead of placing so much focus on the man-made molecules. Edited by tregar, 30 December 2018 - 11:30 AM. While we're talking about the synergistic effects of DMT and other molecules; do you have any information on NMT, Tregar? What receptors do NMT have affinity for and what can be theorized about its role in the psychedelic experience? When referring to smoked DMT, people commonly mean DMT extracted from organic plant sources. The main two, MHRB and ACRB have different alkaloid profiles. MHRB being pure DMT, and ACRB being ~50% NMT and 50% DMT. The ACRB extracts still get referenced as DMT and lumped with all the other DMT experiences. From my personal experience, freebase alkaloid extracts from ACRB give a different feeling from pure DMT from MHRB, even when weighing out more ACRB crystals to account for the lower DMT ratio. I've always hypothesized that they're competing for the same receptors, so the reason ACRB seems weaker is because the NMT is effectively blocking 50% of the receptors from receiving DMT. Yes, Icon, glad you brought that up. See (1) below. Your experienced conclusion appears to be correct: as NMT is not agonizing 5-ht1a, it appears to be competing for the same receptors as DMT ! (1) Study above shows NMT (n-methyltryptamine) to be a poor agonist at 5-ht1a just like DMT. The above study also backs up the 2011 receptorome study (see post #1) that shows 5-meo-dmt and bufotenin (5-ho-dmt) to be potent 5-ht1a agonist (5-ht1a agonism shown by Dr. Nichols to break down 80% of brain 5-ht which is composed of serotonin filters/barriers/doors in the brain) thought to help us survive in everyday life and help to subjectively and theoretically form the ego or thinking consciousness. Icon, you might want to look into this experience from James Oroc (author of Tryptamine Palace) who wrote about the combination of 90% dmt (does not block serotonin) with 10% 5-meo-dmt (blocks serotonin) According to wikipedia, THH found in caapi also blocks serotonin. * With the addition of the 5-MeO-DMT containing toad-venom to the DMT however, the visual characteristic was completely different and totally unique to my experiences so far. On this occasion there was a complete lack of ‘dots’ or ‘points’ of any kind, the fine lines of the constantly changing imagery were like those painted with a single-hair brush on Tibetan thangkas and due to the overwhelming artistry of what I was seeing, I could only think of the vaulted ceiling of the Sistine Chapel in comparison. Edited by tregar, 30 December 2018 - 12:27 PM.